88 Adjectives, 76 Nouns, 64 Verbs, 40 Adverbs. 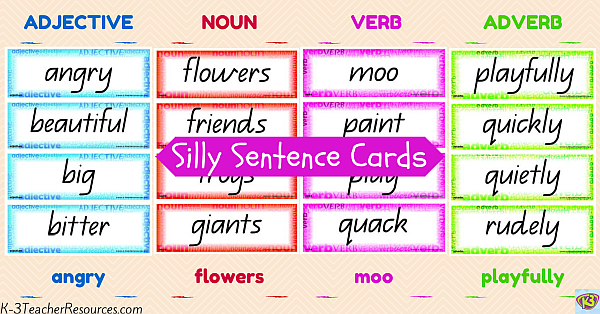 Make ‘silly sentences’ using these vocabulary flashcards sets. For example – adjective/noun/verb/adverb – boring dinosaurs gallop slowly, or just adjective/noun as in slimy frogs, or noun/verb as indinosaurs dance. There are so many different combinations. Fantastic for reference with concept books – ‘I Can see a….’, ‘Look at the….‘ and ‘Here is a…..
Works well as reference with similes – as _______ as a ________. Don’t forget you can print these words in many different sizesusing your printer settings. Print a class copy onto coloured card and laminate for long term use – a different colour card for each group of words is ideal. Again, we have included labels to help with storage. Add these groups of English vocabulary words to your ever-growing class collection of printable flashcards /word cards stored in hanging pockets, or labelled boxes for easy access. There are many more adjectives, nouns, verbs and adverbs. Brainstorm more as a class or in groups and pop them onto the spare blank cards provided in each section. There are heaps of phonics opportunities with these words….play around with them – match them with phonics printables – what patterns can the children find, circle the patterns, colour them in – make it fun. Print off small size black and white copies to do this. You can make these words smaller size by using the reduction settings on your printer and just printing off black and white copies, these smaller sizes are great for cut and paste activities such as cutting out the words and matching rhyming words, and opposites, as well as alphabetical order and making their own ‘silly sentences’ as mentioned above. Use these words as a fantastic reference for the children’s own writing. Love these, thanks!! Saving me so much time and look great in my classroom! Endless resources to help visually resource my classroom!! Thank you!! I would love these to match the jolly phonic grammar colours – nouns (black), adjectives (blue – good match already), verbs (red), adverbs (orange), pronouns (pink), conjunctions (purple) and prepositions (green). Let me know if this is possible as I am sure others will be able to use them for this reason too! Great resource, would be wonderful if I could edit the colours/borders as our school has nouns red/verbs green /adjectives orange and adverbs blue from prep to year 6.